Der TYGON®-Schlauch S-50-HL wurde durch den TYGON®-Schlauch ND 100-65 abgelöst. Since the first open-heart surgery in the 1960s, doctors, surgeons and other healthcare professionals have come to Tygon® as the definitive tubing to use with blood in peristaltic pump applications. Today, TYGON® S-50-HL continues to be the tubing of choice for bypass procedures as well as for use in numerous clinical, biological and pharmaceutical applications. TYGON® S-50-HL meets the increasingly complex challenges of medical devices used in applications such as chemotherapy, dialysis and minimally invasive surgery. Once the compound is approved, in-process inspection protocols specify exact processing parameters so that tubing clarity and appearance are optimized. Dimensional control starts with custom tooling and is assured through use of continuous in-line laser micro-meters and off-line verification with computerized imaging equipment. Final product inspection can include flow rate testing, burst testing and measurement of other key performance characteristics in our own testing laboratory. A major factor when selecting a tubing material is the type of component parts to be bonded to the tubing. Effective bonding of TYGON® S-50-HL is easily accomplished using a variety of methods including heat, electronic (RF)/ultrasonic, solvent and adhesive. Factors to be considered in selecting the components include security of the bond required, effect on the integrity of the materials to be joined, and presence of residues or extractables that may affect biocompatibility. When bonding procedures are not used, mechanical clamps are recommended to provide secure attachment. 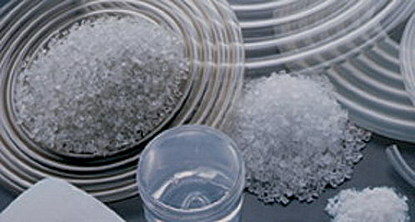 Demonstrating consistency in material from lot to lot once a medical device or drug is marketed is increasingly important. It's the first fully characterized medical tubing to ISO 10993 standards and FDA guidelines for biocompatibility. TYGON® S-50-HL tubing fully complies with the requirements of USP Class VI criteria and is non-toxic, non-hemolytic and non-pyrogenic.